Set in the ancient beauty of the Gilpin Valley, with 72 acres of private woodland and a beautiful tarn, this traditional Inn takes its name from the local legend of Sir Richard de Gilpin who bravely fought and killed a ferocious wild boar close by. The Wild Boar’s fame these days has much more to do with the warmest of welcomes and standard of service complemented by individually designed rooms and classic British menus using the best local seasonal ingredients. Throughout the year there is always a great variety of events happening from regular whisky clubs to food smoking courses, which add an extra element to any visit. Whether it’s the food, an exciting event, the woods and surrounding countryside, or the ambience and character of the Inn, come along and enjoy The Wild Boar next time you want to experience a great day out or a break with a difference. he Wild Boar has 34 individually styled bedrooms with three categories of rooms to choose from. 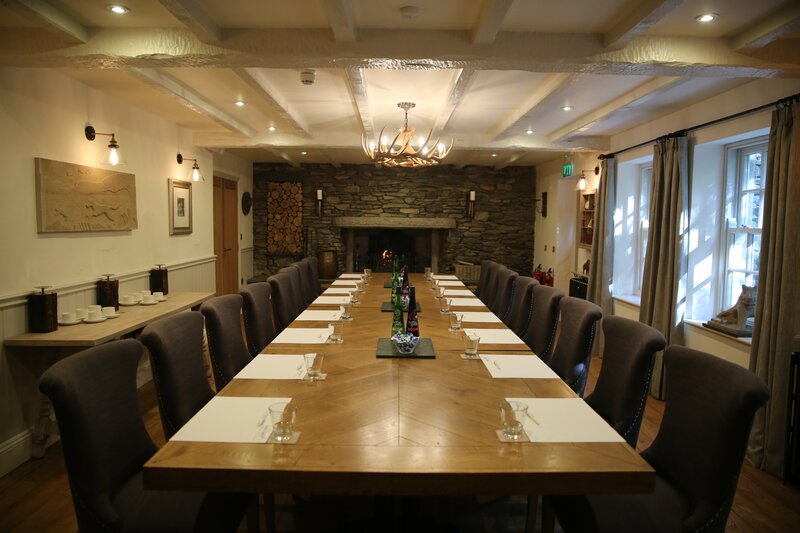 Classic and Feature rooms offer everything you would expect from a four star Lake District Inn whilst the Luxury rooms are perfect if you are looking to treat yourself to something a bit special! The Wild Boar’s grill and smokehouse is a popular stop for Windermere locals and visitors alike. Oak­beamed and cosy by candlelight, the restaurant embraces a passion for tradition and excellence. A highly commended wine list is complemented by a choice of over 100 of the finest international single malt whiskies and a range of traditional ales, including some now produced in our new microbrewery onsite. Guests can even have their own bottle of whisky or other spirits saved for their future visits! The Wild Boar has 34 bedrooms which are individually furnished. There are three different types of room to choose from, Classic, Feature, and Luxury. Standard en-suite double or twin room. The Wild Boar is a dog friendly Inn. It charges £20 per Dog per Night for up to two dogs in one room. 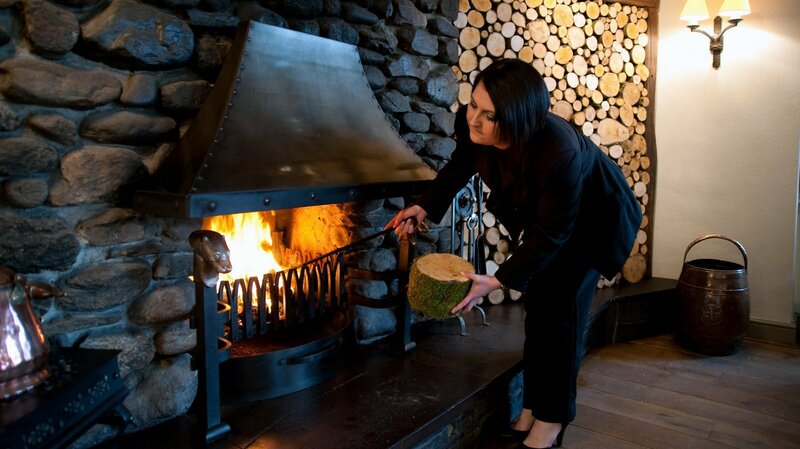 Head chef Gordon Stewart showcases his passion for culinary excellence at The Wild Boar’s Smokehouse & Grill Restaurant. His menu is hugely popular among locals, guests and those who travel from far and wide to experience it. Priding himself in sourcing primarily local ingredients, Gordon makes full use of Lakeland’s natural larder to support the regularly changing menu. The restaurant has been awarded an AA Rosette, was the proud winner of the Cumbria Pub of the Year award in 2014 and was named Visit England’s 2015 Pub of the Year silver award winner. 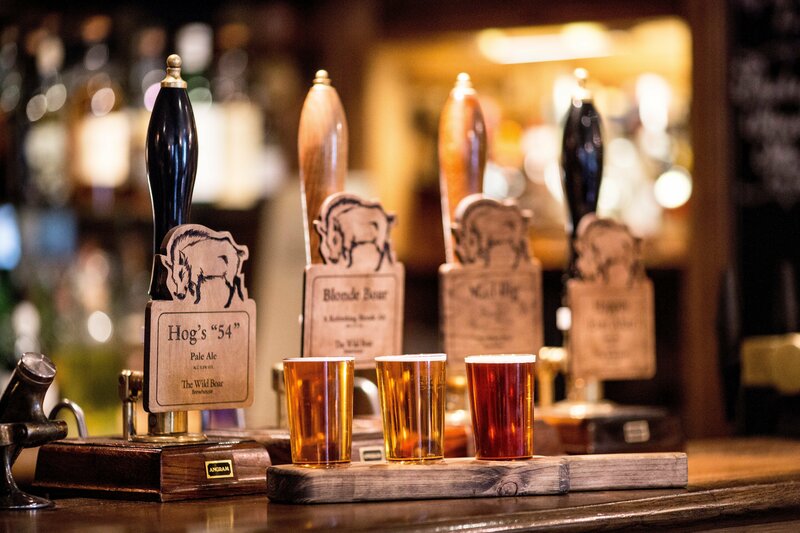 As 2014’s Cumbria Pub of the Year, and runner up of Visit England’s 2015 Pub of the Year, The Wild Boar is popular with both Windermere locals and visitors from around England. 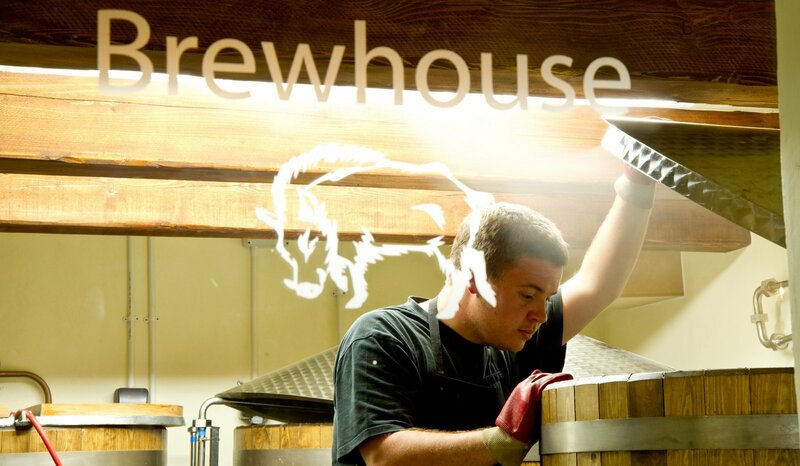 It is renowned for its Smokehouse, its onsite microbrewery, and its use of locally-sourced, seasonal ingredients. The inn also boasts a collection of over 100 international, single-malt whiskies and an impressive range of local and traditional ales, making it the ultimate spot for fine dining. The inn’s Smokehouse is a massive attraction. Creating musky, smoky flavours in their meats, fish and cheeses, it gives the menus a unique dimension. From the house-cured and smoked Loch Duart salmon, to the in-house, peppered wild boar, smoked ox tongue and hand-carved, smoked ham deli board, the smokehouse menu alone is full of real, mouth-watering flavour. 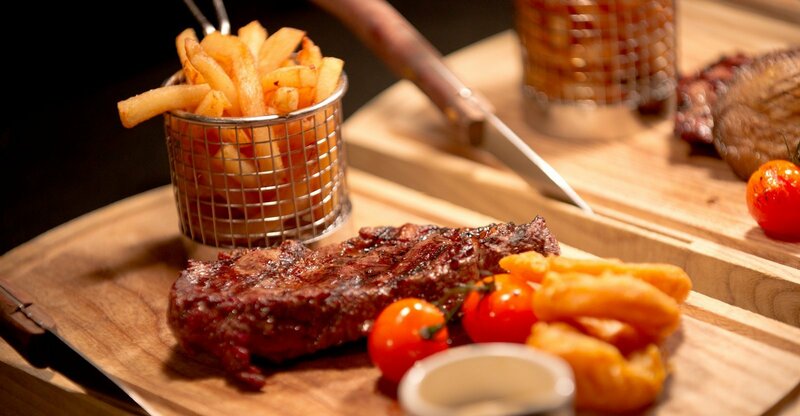 There’s also offer an incredible range of meat and vegetarian dishes bursting with flavour, and made with local, seasonal produce. The Wild Boar hosts it’s very own smoking courses, meaning you can recreate these irresistible flavours in your very own kitchen. The Smoky Jo’s team teaches guests how to use the inn’s own purpose-built smokehouse, and also how to achieve the same amazing results at home: on a stove, a converted BBQ, or even using an old filing cabinet! There’s tasty samples of chicken, salmon, sausages and cheeses handed out throughout the day, and lunch and dinner is also provided. Venturing beyond The Wild Boar Inn, you can purchase your own, local produce from Plumgarth’s farm shop, which is a mere 8 minutes away in the car and sells everything from award-winning, quality pork sausages, to locally produced jams and chutneys and freshly baked artisan breads. They also sell a huge range of ales and spirits, from toffee vodka to locally brewed strawberry bank liqueurs. On the same site also sits the lovely 2 Sisters Café, Kendal’s #1 restaurant on TripAdvisor. Serving only homemade goods, the café sells everything from roasted vegetable and goat’s cheese quiche to sweet, chilli-chicken pancakes, and is well-known for very generous portions. For visitors with a sweet palate, the baked goods are just as highly-rated, white chocolate and raspberry cake, peanut butter and chocolate chip cheesecake and lemon meringue pie being but a few given special mentions in the customers’ rave reviews. Kendal village, approximately 15 minutes away from The Wild Boar Inn, hosts a farmer’s market on the last Friday of every month. The market sells only local produce, grown, raised, or caught by sellers themselves, and experts are on hand to answer any questions. In the other direction, Bowness-on-Windermere is a mere 7 minutes away, and is home to the well-loved Choccobar. Selling thick, rich, Belgian hot chocolate, in addition to velvety ice creams and loaded waffles, this café is hugely popular. The hot chocolate also comes in an incredible array of flavours, from creamy Baileys and sweet, salted caramel to venison and smoky bacon, and are all served with a sponge finger, a bowl of whipped cream and fresh fruit. For younger guests, Bowness-on-Windermere also houses a popular Beatrix Potter attraction, adjoined with a charming tea room decorated with her best-loved characters. This small and quirky café is perfect for afternoon tea, selling ‘peter rabbit’ picnic baskets for children and for everyone else there’s a delicious array of treats such as millionaire’s shortbread, apple and cinnamon cake, rocky road slices! 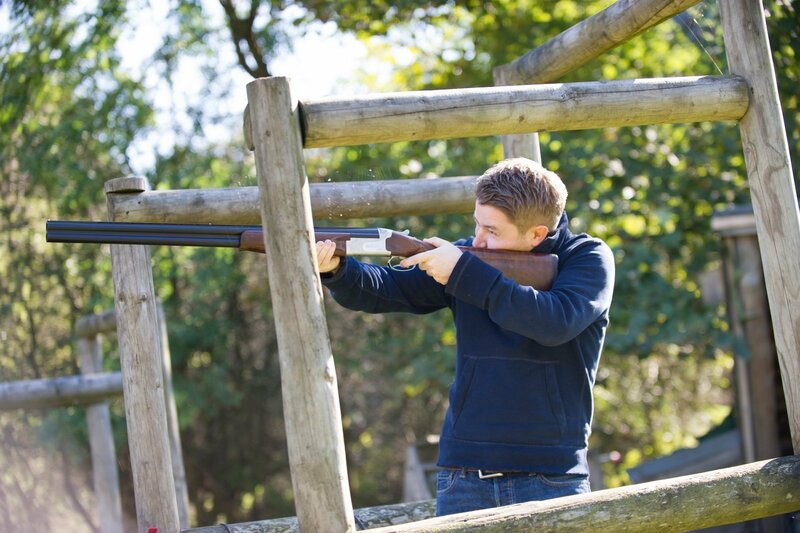 Clay Pigeon Shooting – Why not try your hand at clay pigeon shooting with an Instructor at the purpose built shooting range, situated within the hotel’s very own private 72 acre wood. Archery – Archery courses are also available throughout the year and are open to all abilities. Food Smoking Courses – The Wild Boar is working with smoking experts Smoky Jo’s to provide one day courses, where you can learn how to hot and cold smoke your own food. Those taking part in the courses will get the chance to smoke a range of different foods such as chicken, salmon, sausages and cheeses. As well as using the Inns own purpose built smokehouse. The Smoky Jo’s team will show how tremendous results can be achieved at home – on a stove, converted bbq, wardrobe or filing cabinet! For more information on any of these, contact The Wild Boar direct on: 015394 45225. One of the most stunning settings to tee off in is undoubtedly in the heart of the scenic Lake District at the Windermere Golf Club, with spectacular views over Windermere and the surrounding fells. Only 5 minutes from The Wild Boar, this is one of the best golf clubs in the country. 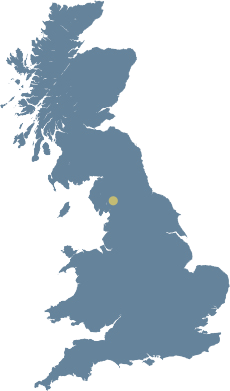 The World of Beatrix Potter is only 10 minutes’ drive, or the more adventurous types can visit Low Wood Watersports Centre, just 15 minutes away. The Lake District is home to Holker Hall & Gardens, just 30 minutes’ drive and in the heart of rural Cumbria, it is one of the best-loved stately homes in Britain. The gardens merge into Parkland framed by the Lakeland Hills, providing the most incredible setting for an afternoon in the great outdoors, while the House is complete with an ornate gallery, magnificent dining room, bedrooms and drawing room to explore. 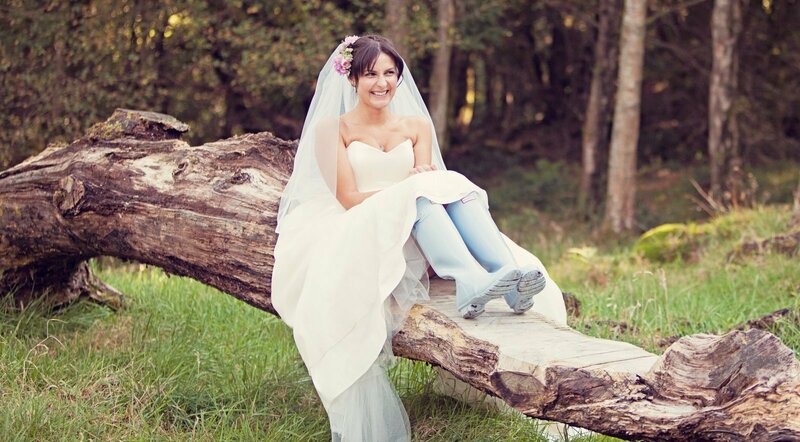 Perfect for families, or simply those with a little more energy, Go Ape! Grizedale is located 35 minutes away, to the east of Coniston Water and to the south of Hawkshead. Whilst England’s highest mountain Scafell Pike provides fantastic walking routes that are as exhilarating as they are breath-taking. It won’t take you long to discover the beauty and romanticism of the great Scafell Pike mountain, which inspired the likes of Wordsworth, Baines and Wainwright. 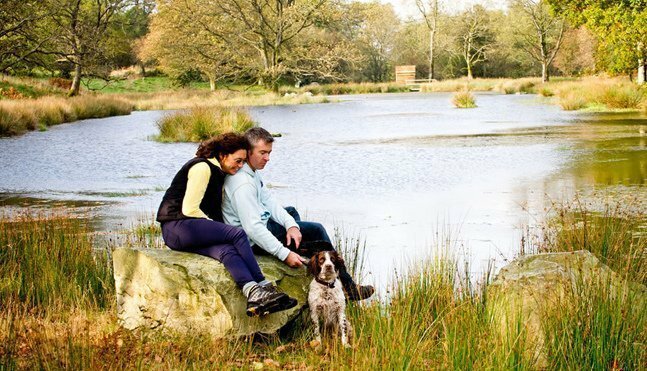 All bedrooms dog friendly apart from the Overmillbeck Suite with a £20 charge per dog per night (maximum £60 per stay). Maximum of 2 dogs per room. Call to request. Dog welcome letter, menu, bed, towel, bowl and treat provided. Dogs are welcome in the bar but not the restaurant.